How Can You Feel Better From Crying? Whether it’s a slight moistening of the eyes, silent weeping, or full-blown sobbing, the emotion that most often accompanies crying is sadness. And sadness (grief, pain or loss) is usually filed, for most of us, under ‘difficult emotions’. So it may sound very strange that someone could actually feel better from crying! Also, crying can be a ‘cover feeling’, or a defence, which functions so we can avoid another emotion such as anger (for example, some people find themselves choking up and weeping every time they get in a disagreement with their partner). In these situations we won’t feel better from crying, because when a core emotion isn’t being attended to (in this case, the core emotion of anger), we feel yucky, muddled and unsatisfied. But there are times when you can feel better from crying. First off, there’s the tearfulness that can come from heartfelt positive feelings such as gratitude, awe, joy, love, and feeling moved. The tears that can accompany those feelings are profoundly healing and strengthening. If you’re having trouble experiencing these (and many people do), working with an experiential psychotherapist (e.g. Art Therapy, Gestalt, AEDP, Emotion-Focused Therapy, or one of the somatic psychotherapies) can be incredibly helpful in opening up and building your capacity to feel these ‘healing affects’. 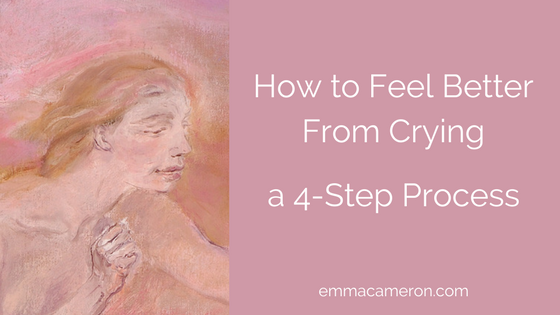 When your tears are a genuine expression of a core emotion of sadness, and you are able to experience this with self-compassion and support, a lovely thing can happen. After the waves of sadness have peaked and then subsided, you can find yourself for a while in a tender, open-hearted state of peace and connectedness. So let’s get to it. How exactly can you feel better from crying? I’ve identified four steps you can take, that may help. We can’t control our feelings, exactly, but we can get a lot better at managing how they flow. Imagine you had a tap that could only be fully on or fully off. It would feel a bit daunting when you wanted to use some water, knowing that water would gush out of the faucet with full force, and probably soak you, along with everything around you. Having the tap stuck full-on is not good: We don’t want to keep being flooded or re-traumatised by a feeling such as overwhelming sadness. The tap stuck in the off position is bad, too: We don’t want to feel blocked and stuck, unable to experience the release and connection that safe expression of feelings can provide. What we need is to develop our ability to regulate feelings so that we know what we feel, and we can express our feelings appropriately and without being too scared by them. Of course there is a time and a place for everything, and this certainly applies to selecting when to let the tears flow and when to hold them back for a bit. It’s going to take a bit of time and practice as you gradually get better at learning how to manage the subtleties and nuances of allowing and suppressing your tears. Managing your feelings can be a bit clunky and ‘stop-start’ at first. That whole process could take anything from a couple of minutes, to an hour or longer. When we can really do this with core emotions, the feelings don’t stay stuck and fixed (despite our fears); they keep evolving and transforming. Click here for a simple infographic, The Creative Person’s Guide to Managing Feelings. Self-compassion is a HUGE help in managing your feelings. It isn’t the same as self-pity, or being self-absorbed. In fact, when we can be truly compassionate to ourselves, it frees us up to be more present for other people – and more compassionate to them too. Crying tears of sadness whilst feeling deep self-compassion, can truly feel healing and restorative. Read my article, How to Love Yourself, or research Kristin Neff’s work on self-compassion. Neuroscience studies have shown that very different things get activated in the brain and body, depending on who is with you, and what their attitude is. There’s a huge difference between crying alone (or being tearful when you’re with someone who has difficulty with your crying), compared with crying in the compassionate presence of a calm, containing, empathic and grounded other person. Do You Always Cry Alone? Many of the people who come to me for therapy tell me that they normally only ever cry in private. For many, it’s in their bedroom; maybe even in bed, hidden under the covers. Or in the car, parked well away from others. Or even in the washroom at work. (a) You offer yourself self-compassion (see below). (b) You also have times when you can cry in the presence of someone who is able to be empathic and accepting. …then they’re not (currently) in a position where they can help you with your feelings. Unfortunately, if you cry in the presence of someone like this, you will not feel better from crying (neither will they). When certain people are around, or you are in a place that doesn’t feel private or safe enough, then it’s fine to ‘save up’ your crying for a short time, until you can get to somewhere (and/or someone) safer. This is important: You don’t necessarily have to ‘let it all out’ at the same moment you first feel it. But you do need to make space for the feelings reasonably soon after you first notice them. You may be lucky enough to have a friend, relative or partner who also has these skills, at least at times. But remember: it’s sometimes really hard for a friend or loved one to be able to just ‘be’ with you while you express sadness, without getting triggered themselves. Especially if you’re tearful about something that involves them directly. A counsellor, psychotherapist, or Art Therapist is trained to be comfortable and unfazed by someone’s crying. Does that mean they’re impassive, and won’t be affected by your tears? Actually, no! Therapists need to use their own empathy – it’s a very important part of how they help their clients. They feel things with you. A good counsellor or therapist will know how to contain and hold space for you to explore and express painful and confusing feelings. They won’t feel overwhelmed or want to shut you down. They won’t push their own feelings onto you, or make you feel you’re burdening them. This can help you feel that your tearfulness is manageable, has meanings that can be valued, and is part of a process of positive growth and change. If you aren’t used to letting yourself express sadness through crying, it may feel clunky. Odd. Strange. When you cry it might even feel deeply ‘wrong’. Like you shouldn’t be doing it. Like you’re breaking some unwritten rule that you’ve always lived with. And when you aren’t used to crying, you can feel out of your depth, adrift in a sea of tears and sadness. Crying can feel really unsettling when you’re not used to it. No prizes for guessing what helps… Practice! Firstly, work on points 1, 2, and 3 above. Over time, things should shift – especially if you work on deepening your self-compassion on a daily basis. Crying may start to come more easily to you. So that in time you find that you really can feel better from crying. But What If You Simply Can’t Cry? If you can’t ‘just do it’ – because when you try, the tears just won’t come – don’t worry. You’re not a freak. This is actually pretty common. It was a helpful survival strategy for you, for a long time. It worked to keep you feeling safer when you were growing up. And part of you is still stuck in those times. Part of you is really scared that if you cry, you’ll be bullied, shamed, or otherwise harmed. Even if you know that the shaming would only come from yourself, these days. You might find my article ‘How to Love Yourself’ helpful, for guiding you to tune in to your hidden feelings. If it keeps on feeling too risky or difficult to cry – or if you simply want to speed the process up a bit – do consider going to see a therapist or counsellor. You can work online, or you can work with a therapist in their office (Read my article, Your First Counselling Session: 12 Things You Need to Know). I offer online counselling, and I also practise Art Therapy, psychotherapy and counselling with creative, sensitive, thoughtful women and HSP’s (Highly Sensitive People) in north Essex/ Colchester area. What have you found that’s helped you to feel better from crying? If you’re willing to share your thoughts, do leave a comment below.